I have owned a pair of Canary CA-330 mono-block amplifiers for several years. I own the Mk-I version of these amps which is now out of production and has been replaced by the Mk-II model. According to Canary the Mk-II is basically modifications and upgrades to the MK-I. Canary claims “deeper bass and crisper treble” for the new version. I guess I should start out by admitting that I love these amps and if the MK-II is equal or better to the MK-I, which is certainly a reasonable assumption, I am sure I would love it too. Canary appears to me to be a bit of a strange bird. Sorry, I couldn't resist the pun. On their web site they don't indicate an address or place of business. If you try to find dealer locations there is only one address that shows up for the USA, JM Sound, and none for Canada. Keying in the web address of JM Sound leads you to a web page for sale! On the other hand, digging around on the internet will bring up a lot of Canary products for sale. I have not been able to find any recent official retail pricing data for Canary products. I believe that the original retail on them was around $9000 Canadian. However at that time the exchange rate was quite low and in fact I believe that the US retail at the time was in the $6000. range. My amps were bought second hand from a local audiophile/engineer who decided that he was going to build his own SET amps. I have been in contact with Canary on a few occasions with some technical questions both by telephone and by email with mixed results. Sometimes I received excellent service but on one occasion I spoke to someone who had significant difficulty speaking English. Sometimes I got a 24 hour response to my emails and other times I had to follow up with rather blunt language before I got a response from their tech support department. I believe that there is an authorized service location on the eastern coast of the USA and one on the Canadian west coast however that needs to be confirmed. The manual for my CA-330s is very basic but delivers the essentials. There are 2 pages for safety information, 1 page for tube installation, 1 page for tube biasing and 1 page for specs. One of the most important items in the manual is of course the tube biasing information and of course Murphy's Law kicked in – they got it wrong. Fortunately the number in the manual is so far off that no-one who is familiar with tube amps would try and set it there. I did end up calling Canary to get the right number (0,55 V). More about biasing in the Technical section. 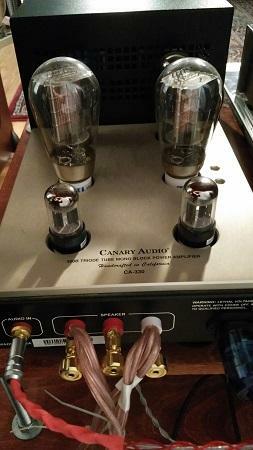 Canary describes their design as “... a class A triode mode, push-pull monoblock power amplifiers with the use of two 300B output tubes per channel.” Basically this is two Class A triodes feeding the same output transformer, one from each end. 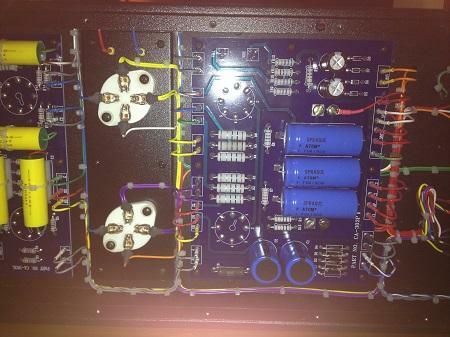 Each mono-block amplifier has six tubes; a pair each of 5U4GB rectifiers, 6SN7GTB pre-stage, 300B power amplifiers. Each unit weighs 65 pounds, the weight of course is mainly due to the huge transformers that are used. Canary claims that their custom designed transformers are an important contributor to the overall sound of their amplifier. Having used various MC step up transformers of very different size and cost in my system over the years I can certainly attest that transformers can really make a difference. Oddly the Canary web site indicates that the 26 Watt power rating is an improvement in the MK-II design but the manual for the Mk-I also indicates 26 Watts! Canary makes another model called the CA-339 which I understand to be identical to the CA-330 except that it carries four 300B tubes per unit instead of two as in the CA-330. This big brother has a rated power output of 50 Watts. On his web site Arthur Salvatore has listed the CA-339 as High Class B. Considering the way Arthur has set up his rating system and the fact that in his Class A there are only two in-production amplifiers, the Class B rating is extremely high praise. The units are very solidly built with very heavy gauge sheet metal and massive front plates. Note that I have replaced the original power cords, which look to be standard computer cables, with 12 gauge cables. Power consumption is 240 Watts per unit so if you leave these on all day you can run up a nice electricity bill. Both amps are running off the same circuit that basically feeds all of my listening room so I decided to beef up these cables. When the big toggle switch on the front of the unit is flipped on the two glass windows light up in blue writing. All around, these units give a strong feel and look of high end gear. As you can see from the photo below, the quality of construction is carried over to the inside of the unit as well. The materials and connections are heavy gauge and high quality. The interconnect wires are terminated with soldered pins which are then soldered on both sides of the boards. Note the use of Hovland Musicaps. (all of the yellow ones) In the photo the rectifier tibes are mostly hidden behind the 300B tubes. The input sensitivity value can present a bit of an issue; given a typical nominal preamp output of about 2 Volts and the use of high efficiency speakers as is often the case with such low power amplifiers then the useable range of the volume control can end up being something like 0 to 25%. This in fact is my case as I am using Coincident Total Victory II speakers that are about 96 dB/Watt in a relatively small room. One technical detail that warrants mention is biasing. In the Canary design the 300B tubes need to be biased manually using a trim pot for each tube. In my case the amps are placed so as to make the speaker cables as short as possible but that makes them not very accessible, so to get at the trim pots with a screw driver and a multimeter I need to a great deal of flexibility, a strong light and 3 hands. I have found that setting the bias is a very long process, typically it takes me 2 days to complete the whole thing. The tubes have to be fully warmed up before you start and I find that they need to stabilize for about an hour between each adjustment. As the adjustments are minute and there is a significant tendency to overshoot and the setting of one tube has a bit of effect on the setting of its partner, several repetitions are required. I have spoken to Canary about this and they say, of course, that the bias adjustment should be quite easy to do. So either my amps are abnormal or the 300B tubes that I am using are harder to bias than others or ...? In any case the sound of these amps motivates me to put up with the biasing pain. I am a big fan of 300B tubes when they are applied properly. Its quite possible to design a 300B based amplifier that doesn't have the soft or mushy bass or the over-the-top mid-range attributed to 300B tubes. In a well designed amplifier, matched with compatible speakers, 300B tubes can produce superb results. There is a wonderful ability to transmit the music in all its beauty and detail without any dryness or artificiality. OK I realize I am getting a bit romantic but you get the picture. The CA-330 has an extremely high performance ceiling. What I mean by that is that if you fit it with high quality tubes, surround it with high performance components and interconnects and feed it with quality music recordings the results will be stunningly good. Since I first installed these amps in my system it has undergone many upgrades and with each change the results were immediately noticeable. When I upgraded to NOS tubes in my preamp and phono stages I clearly heard the improvements, when I switch phono cartridge, MC step up transformer, interconnects, you name it, I can hear the difference. In a nutshell the CA-330 takes what you give it and reproduces it with such fidelity that any changes to the system come through to your ears. My first setup with the Canary amps was with Gallo Reference 3.1 speakers. One of the strong points of these Gallo speakers is their the ability to clearly place and focus instruments and voices in the sound stage. With the CA-330 amps the placement and focus side to side and front to back was crisp and precise. I listen to a lot of fifties and sixties jazz quartets and quintets and some of these recordings were produced with a lot of attention to instrument placement. The Canary/Gallo setup was up to the task. The Gallos are gone now and the Coincident Total Victory II speakers, although superior in most aspects, don't focus as well as the Gallos. Not the amp's fault. Dynamics are another area where the CA-330 scores very high. I always thought that the dynamic range of these amps was good however when I installed my new Doge 8 preamp with 1966 Seimens NOS 12AT7 tubes in the system I was frankly surprised by the results. The dynamic range improvement was huge. Again, all the CA-330 needed to perform at a high level was a better component in front of it. The rectifier and pre-stage tubes in my Canary amps have been upgraded to Phillips JAN new old stock (NOS) tubes. The one exception to the impact of upgrades that I mentioned in the paragraph above would be the switch to NOS rectifiers. I can't really say that this had a noticeable impact. I do know that a USA Canary dealer once wrote an article stating that this was a good way to improve the performance of the CA-330 at fairly low cost. Well I didn't hear it! I have tried 3 or 4 different types of 300B tubes and my favourite is the TJ Full Music 300B/n. The factory original ElectroHarmonix tubes were just OK, a little weak in all aspects and not in any way up to the performance potential of this amp. A local audiophile lent me his KR 300BXLS, these are incredible beasts with speed, detail and dynamics right off the chart. Also a pretty hefty price tag. If you want to hear every tiny detail on your Steely Dan or 10CC records, including things that you didn't even know were there, then the KR is the way to go. In my case, I found this exciting but too analytic. Too much detail to enjoy the music. Roger Hebert at Wyetech labs suggested to me that the TJ Full Music 300B/n would be a significant upgrade without breaking the bank. They just hit the sweet spot for me. They have clarity, precision, speed, dynamics and openness without the aggressiveness and the minute detail of the KRs. Overall a more pleasing musical treatment of the source. Roger Hebert tells me that he has moved on to other newer generation 300B tubes since then however they are all more expensive than the TJ Full Music tubes. I have been sitting at my computer thinking about how to describe the overall sound without resorting to vague superlatives. The words that come to mind are speed, clarity, precision, open, dynamic, musical. 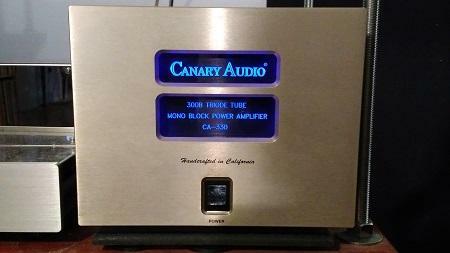 In summary, with quality tubes the Canary CA-330 fully delivers on the promise of 300B magic. You could listen to a lot of products in this power range, at any price point, before finding something that beats the CA-330.